Hi, we`re Tookie and Avis, a sweet and tame mother-daughter pair of lutino cockatiels. Tookie is the mother and she`s older than 10 while Avis, the daughter, is about 8 years old. Both of us have been in a Mickaboo home for many years and have received great care and human companionship there. Our current human companions, who are also fostering us, have four other male cockatiels with whom we used to share a cage. Unfortunately this housing situation made the males quite aggressive and stimulated us girls into egg-laying mode. Separating us from the guys calmed things down all around but it also left us without enough space. 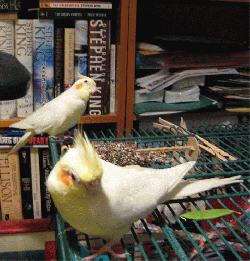 Like most cockatiel hens, we`re pretty gentle and quiet. We love being around people, even if it`s just to watch them. We love being scritched on the head, handled by adults and mature children, talked to and showered with mist bottles. Our favorite toys are corn husks that we can preen. We would like to go to a home where we will get plenty of time with human friends, plenty of sunlight and plenty of room to play. We would like to stay together and live in the same cage, and we will be glad to live with other cockatiels as long as they are not aggressive males. Our human companions will be very sad to see us go but they want what is best for us. So, for now we are two lovely ladies in waiting. Would you like to take us home?